That armed conflicts produce far-flung profits is no secret. Yet buyers and other facilitators aware of their involvement continue to make violent operations lucrative, stoking irreversible harm to affected communities and impoverishing otherwise resource-rich nations. Armed groups and war criminals worldwide operate with the complicity of foreign business partners, government officials, transnational financing networks, and international financial institutions. In East and Central Africa, this is as true for the last remaining Lord’s Resistance Army fighters poaching elephants in Garamba National Park as it is for government army forces occupying oil-rich areas in South Sudan’s northern states. These operations are only possible with money, equipment, and the opportunity to bring goods to market. Foreign business networks aid war criminals in the extraction, transport, and laundering of criminally-derived profits with materials, funding, services, and financial incentives. The value of the materials they steal and trade—among them gold, weapons, ivory, and timber— is only as high as the price foreign buyers are willing to pay. With widespread impunity, many of the most powerful co-conspirators and facilitators of atrocities—banks, refiners, offshore trusts, natural resource buyers and traders—continue operating, often quite profitably. All of this points to a little-discussed truth about war crimes and the international community’s quest to combat them: to hold their perpetrators accountable, governments, the private sector, and the courts must take aim at the financial infrastructure fueling these atrocities. Authorities in national and international courts should improve their approaches to investigating the financing of atrocities, greed motives, and profits derived by war criminals. They can do this using tools already at their disposal, including statutes prohibiting theft, sanctions violations, and atrocity crimes; diverse theories of liability; financial investigation strategies; and the seizure of ill-gotten wealth. If these powers are not brought to bear, key perpetrators, facilitators, and beneficiaries of some of the world’s worst crimes will continue to operate with impunity, and extreme violence will continue. Courts must also wield more effective ways to punish the financial crimes that often accompany war crimes, crimes against humanity, and genocide. Individuals who have faced war crimes prosecution generally keep their wealth and avoid charges for the economic crimes essential to their violent strategies. Some of the most notoriously business-savvy war criminals, including Charles Taylor, were never prosecuted for their financial crimes. In these and similar cases, the courts missed opportunities to directly address systematic acts of pillage and identify the profits resulting from crimes, leaving illicit financial networks and illegal assets untouched. Financial actors can be more vulnerable to apprehension than political and military actors. They operate all over the world. At the same time, financial actors can be more vulnerable to apprehension than political and military actors. They operate all over the world. With business operations occurring outside the immediate geographic theater of crimes, law enforcement in a variety of legal systems can intervene in meaningful ways. According to the judgment, Kouwenhoven said he was part of Taylor’s “second inner circle,” comprised of “the major business people” with direct relationships to Taylor. For Taylor’s part, he considered Kouwenhoven’s company his “pepperbush” during the war, using a traditional Liberian moniker meaning something of great personal financial interest. Kouwenhoven’s conviction was groundbreaking, despite relying on a simple notion: just as financial interests accompany war crimes, financial investigations should accompany war crimes investigations. Given vast evidence showing that despotic army, government, and rebel leaders prevailing over the world’s worst humanitarian crises each have their own “pepperbush” networks, justice authorities should work hard to ensure the Kouwenhoven case does not stand alone for long. To be clear, there are good reasons for the finance blind spot in war crimes trials. Successfully prosecuting atrocity crimes in even their simplest form is difficult. Practitioners face the daunting tasks of eliciting cooperation with foreign jurisdictions, gathering evidence in multiple countries, protecting witnesses in remote high-risk environments, and gaining custody of suspects in conflict zones. Financial investigations only add to these complexities. Like most innovations, they are also not cheap: new expertise in financing and international criminal law, which has been scarce in practice, is required, meaning multiple public and private-sector institutions must contribute effort and resources. Complicating matters further, investigating financial crimes or actors linked to atrocities often requires the political will to probe popular and profitable multinational business networks. With formidable legal and public relations resources at their disposal, these multinational corporations can wield influence over political actors in various jurisdictions, deterring them from supporting investigations into complex financial networks. Despite these challenges, investigating and prosecuting the financial dimensions of atrocity crimes may give war crimes prosecutors easier paths to justice. Documentary evidence, including export and bank records, business disclosures, and social media captures—all of which are useful for demonstrating links to defendants—can be more reliable and accessible than other evidence like victim testimony. And since many of these investigations can be led in jurisdictions in Europe or North America, prosecutors can avail themselves of war crimes units designed to pursue successful criminal cases and asset forfeiture actions. Investigating and prosecuting the financial dimensions of atrocity crimes may give war crimes prosecutors easier paths to justice. Recognizing that international financial pressure can play an intervening role in limiting violence and human rights abuses, policymakers in North America and Europe have recently increased their attention to international financing and kleptocracy. * This trend suggests growing recognition that civil lawsuits and asset seizures can help combat illicit finance on an individual and corporate level, complementing broader network sanctions and anti-money laundering (AML) measures and, together, helping curb the flow of money from war zones to profiteers. Still, many of the financial activities that sustain cycles of atrocities are criminal acts that elicit no criminal punishment. That is why prosecutors at international courts and in domestic war crimes units should view financial crimes— including theft, bribery, money-laundering, sanctions violations, and other economic misconduct—as targets of accountability, their perpetrators as crucial to the structures of violence in war zones as the killing of civilians. This report proposes a shift in our approach to justice for serious international crimes, targeting the perpetrators of atrocities where they are often most vulnerable: their money. 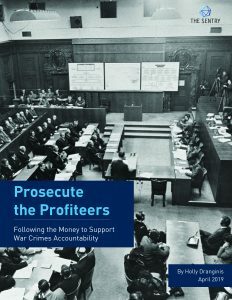 * The report describes new approaches that can be integrated throughout the phases of investigation and trial: using financial investigations to more effectively prosecute atrocity crimes, prosecuting the financial crimes that enable or motivate atrocity crimes, and seizing criminally-derived assets as a measure of accountability and to fund reparations. The analysis and recommendations focus on one of the deadliest and most lucrative parts of the world, East and Central Africa, and highlight important contemporary cases from elsewhere in the world.